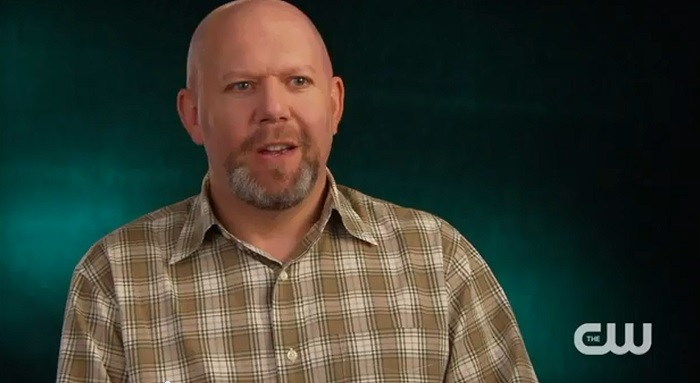 MARC GUGGENHEIM: We talk in the writers’ room a lot about, are there too many characters that know and does it diminish the secret identity? Where we have come from is the philosophy that, when members of our cast of characters know, it draws them into Oliver’s world and it draws them into the show more. So, we tend to get more story out of people knowing than people not knowing. You could say that too many people know, but we always use The Dark Knight trilogy as our compass, and a lot of people knew that Bruce Wayne was Batman, particularly by the third movie, and it doesn’t diminish my enjoyment of watching those stories unfold. Obviously, there are different philosophies and different points of view. For us, as writers, we always go towards whatever gives us more story, and more interesting story. For now, at least, certain people knowing is more interesting than certain people not knowing. Question: Will any characters from The Flash pilot show up in Episode 19? MARC GUGGENHEIM: Yes. The reason I’ve been holding off on Tweeting the title page for Episode 19 is that 19 is co-written by Geoff Johns, Andrew Kreisberg and Greg Berlanti, the team behind The Flash, and I felt like, if I Tweeted that, the jig would be up. Little did I know, the jig would get out itself. But Danielle Panabaker, who plays Caitlin, and Carlos Valdes, who plays Cisco, two members of Star Labs that are part of the regular cast of The Flash, do make an important appearance in Episode 19 of Arrow. This was something that really came about because Barry was in a coma at the end of Episode 9 and that made it impossible for Barry to appear in Episode 19 or 20 of Arrow. He’s gotta stay in a coma until October of next year. But, the idea of bringing in those characters really appealed to us because it allowed us to honor our original intention that we had at the beginning of the year, to do something Flash-related in Episode 19 or 20, without having comatose Barry and paying Grant Gustin a lot of money to sit around with his eyes closed, unconscious for the whole episode. We wrote that episode and it’s really boring. But this episode is really cool and it allows us to further flesh out The Flash universe in Arrow. We get to see their dynamic. They actually shot their scenes for the Arrow episode, contemporaneous with shooting The Flash pilot. Both Episode 19 and The Flash were in production at the exact same time. That isn’t why we did it. That was an added producing/logistical complication. But, it’s just so much fun to see these characters. It’s like previewing Boba Fett in the holiday special. Hopefully, Episode 19 will be a little bit better than the holiday special, but you can see the analogy. Be sure to check out the full interview over at Collider, where Marc Guggenheim gives some more great insight on several characters and where they’re going for the rest of the season.